many people with multiple sclerosis. Talk to your health care professional or contact the National MS Society at nationalMSsociety.org or 1-800-344-4867 to learn about ways to help manage multiple sclerosis and about current research that may one day reveal a cure. 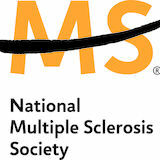 The National Multiple Sclerosis Society does not endorse products, services or manufacturers. Such names appear here solely because they are considered valuable information. The National Multiple Sclerosis Society assumes no liability for the use of contents of any product or service mentioned. Information provided by the Society is based upon professional advice, published experience and expert opinion. Information provided in response to questions does not constitute therapeutic recommendations or prescriptions. The National Multiple Sclerosis Society recommends that all questions and information be discussed with a personal physician. We mobilize people and resources to drive research for a cure and to address the challenges of everyone affected by MS.
Get Connected and Raise Awareness with New Online Community What if everyone living with multiple sclerosis could connect with one another, with those who care for someone living with MS, or with those who research ways to stop, restore or end the disease? The National MS Society is virtually making those connections a reality. You can join the Society’s new MS Connection online community and make meaningful connections when, where and how you want. Best of all, you can connect with free, easy access to the best content and resources the MS community can bring you, including photos, group discussions, updated blogs, videos and more. You’ll learn about topics that are most important to you, connect with others, and have expert MS information and opinions right at your fingertips. Check out this new connected community at MSconnection.org today. This Summer, Volunteer to Make a Difference Volunteering is always in season at the National Multiple Sclerosis Society. Volunteer opportunities are available for a wide range of talents and skills, and for both one-time and ongoing activities. Volunteering with the Society is a great summer activity for individuals and families, as well as groups from schools, churches and companies. Many corporations and organizations volunteer with the Society as a team-building experience. For information on volunteer opportunities near you, visit volunteerMS.org or contact the National MS Society directly at 1-800-344-4867. Members of the BP MS 150 Club 300 pitched in this spring to clean up a stretch of adopted highway FM 159 in Fayetteville. The BP MS 150 Club 300 is an elite group of cyclists made up of the top 300 fundraisers in the two-day Houston-to-Austin event each April. Last year, Club 300 participants raised more than $3.6 million to support multiple sclerosis research and programs. Offices Closed Our offices will be closed Wednesday, July 4, for Independence Day. We will reopen Thursday, July 5.
a trained Society volunteer. To find a Self-Help Group near you, visit nationalMSsociety. org/txh and click the Programs and Services link in the upper left-hand column, followed by the link for Self-Help Groups. It’s time to sign up, lace up and step up to get moving this year. Seven Walk MS events are planned for this fall throughout Texas. Walk MS – recognized as the rallying point of the MS movement – showcases our Lone Star community coming together to raise funds and awareness as we move toward a future free of multiple sclerosis. Earlier this year, the Texas walks successfully kicked off with the spring series in Amarillo, Corpus Christi, Dallas, El Paso, Fort Worth, Lubbock, Odessa, San Angelo and San Antonio. Walks are festive, fun-filled, family-friendly events held in accessible locations. Families, friends, coworkers, students and neighbors team up to step up for the MS mission. Refreshments and entertainment are provided, and many sites welcome our leashed fourlegged friends to join the fun. Commonly asked questions include: Is there a registration fee? No. There is no registration fee to participate in Walk MS. I’m walking and my family will join me. Should they register for Walk MS? Yes, absolutely! All walkers, regardless of age, must register to participate in the Walk MS event. everyone know you’re joining the MS movement (and they can join you, too). For details and free registration, visit walkMStexas.org. You can also call the National MS Society at 1-800-344-4867 (press 2 to be connected with your local office). James Black is the editor of MSConnection. He can be reached at james.black@nmss.org. ST TO MAKE SURE IT DOESN’T. have time to be tired so she just went on with her life. After Connor was born, the headaches, numbness, tingling and fatigue returned. Doctors initially diagnosed her with post-partum depression, according to a video the family made about their experience. Then one day when Connor was about 11-months-old, Annette Grossman woke up to find she had trouble seeing. Optic neuritis had reared its ugly head, although the video reports that was initially misdiagnosed as a scratched cornea. After seeking a second opinion, she was diagnosed with relapsing-remitting multiple sclerosis. While Annette was on steroid treatment for the optic neuritis, she lost the use of one of her legs. MS isn’t new to the Grossman family. Michael Grossman’s sister also lives with the disease. Both Connor and Jackson have grown up in a multiplesclerosis household. They understand when mom is having a bad-MS day. Even though Jackson is more than three years older than Connor, he can’t remember a time when mom wasn’t sick. “They’ve dealt with it [MS] their whole lives,” Annette Goodman said. “They’re good at it.” Both boys may be good at dealing with MS, but they’re determined to keep raising funds to fight the disease until scientists find a cure. Yavonda Chase is a contributing writer from Little Rock, Ark. Person on the Move Lesha Elsenbrook, an active community volunteer, was honored for her caring work, impacting so many lives in Houston. Representing the Company on the Move award winner, UT Health Science Center Houston Department of Neurology MS Clinic, was Dr. Jerry Wolinsky, who spoke of research and new discoveries to help those with MS. Ann Young shared her personal story of being diagnosed and living with MS. Melanie Lawson, KTRK-TV Channel 13 anchor, led the day as emcee. Lester Smith and his wife Sue danced to his signature song “I Will Survive” before reading from his book “You Gotta Dance Like No One’s Watching” and talking of his uplifting way of looking at life. Applauding the successful efforts were A.J. Brass, Amy Zadok, Brooke Robertson, Stephanie Cockrell, Jill Wasserstrom, Sheridan Williams, Regina Rogers, Judi Johnson, Roz Pactor, Mary Ann McKeithan, Ginger Kanaly, Pamela Doty, Tom Elsenbrook, Kay Holmes and Emily Covey. Editor’s note: Diagnosed at 15, Kelli Sims is a vibrant young leader in the MS mission. Her Walk MS team, Kelli’s Krew, was one of the top five San Antonio fundraising teams this spring, raising $13,184. 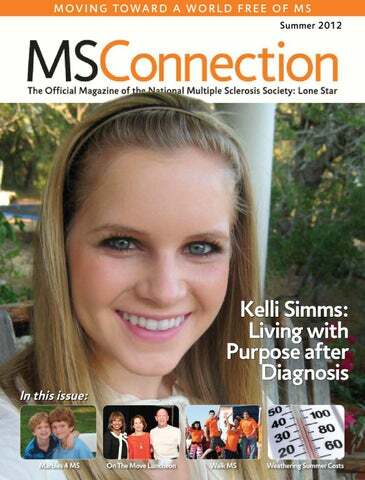 A Society scholarship recipient, the San Antonio senior recently shared her MS story with more than 850 students at her high school for MS Awareness Day; Kelli graciously shares her story here with our MSConnection readers. For cyclists and those seeking a personal challenge, Bike MS is the premier fundraising cycling series in the United States. This year, thousands of cyclists are joining the National MS Society to saddle up in events throughout the Lone Star State to raise awareness and funds to fuel multiple sclerosis research, programs and services. Earlier this year, the 2012 Bike MS roster kicked off in April with the 28th Annual Houston-to-Austin BP MS 150 – the largest event of its kind in North America with 13,000 cyclists and the Society’s largest single U.S. fundraiser, with a 2012 goal of $17 million – and the 25th North Texas-based Bike MS: Sam’s Club in May. This summer, things heat up with the Bike MS: Cactus and Crude, presented by Apache on July 21-22.
in New Braunfels. The next morning, thousands of cyclists make the return trip to San Antonio. Participants are fully supported on every leg of each Bike MS route. Thousands of volunteers, medical professionals, law enforcement officers, ride marshals, radio communications crews and more help ensure a safe, smooth trip on ride weekend. In addition to the Texas treks, the Society hosts Bike MS events across the region. Upcoming events will be held in New Mexico Aug. 25-26; in Little Rock, Ark. Sept. 8-9; in Oklahoma Sept. 15-16; and from Louisiana to Mississippi and back Oct. 6-7. For information on the 2012 Bike MS ride near you – including how to participate, volunteer or donate – visit bikeMStexas.org. James Black is the editor of MSConnection and can be reached at james.black@nmss.org. Learn more about what you can do when the cost of staying cool in the summer rises faster than your ability to pay. TDHCA operates a toll-free energy assistance helpline. TDHCA can assist you in locating the billing assistance program agencies in your area, including summer utility assistance. 211- The United Way Phone: 211 are receiving help from an energy assistance provider and sufficient payment has been made, the provider can send a letter to your utility company to prevent your service from being shut off. If turning off your electric service would make a medical condition â&#x20AC;&#x201C; including MS â&#x20AC;&#x201C; worse, you should submit a letter from your doctor to your utility company. This will delay any shutoff for up to 63 days, but you can re-apply. During that time, you are required to develop a payment plan with the company. Procedures on disconnection and exemptions for critical need customers vary for gas utilities and cityowned utilities. You are encouraged to contact these providers directly to avoid disconnection and make payment arrangements. In Texas, the company that owns your electricity meter and that will disconnect your service is not the same company to whom you pay your bill. Showing your receipt for payment may not be enough to stop a scheduled disconnection. Offers information on low-income assistance programs, emergency disconnection rules and more. provider and apply for assistance, call 877-399-8939. Many electric, gas, and city-owned utilities offer assistance programs funded by voluntary contributions from customers. Contact your local utility to find out if additional assistance is offered. Weatherization Assistance You can lower your energy bills by preventing air conditioning from escaping through cracks and gaps around doors and windows. If your annual income is less than $11,963 for one or $16,038 for a couple, you can apply of assistance from the Weatherization Assistance Program (WAP). Priority is given to the lowest income households, and to those with residents who have a disability or are elderly. This program will help you pay for energy efficiency measures, such as insulation and weather-stripping, as well as for emergency repair or replacements. To locate the WAP service provider nearest you, call toll-free at 888-606-8889. MS or any other condition that might have affected the results. Each participant was tested for the ability to process a mental task and for learning and memory. The average outside temperature on the testing day was recorded. The results showed that people with MS tended to perform worse when the weather was hotter than when it was cooler. People without MS performed equally as well regardless of the outside temperature. This study has several implications. Awareness of heat-related problems with mental tasks may impact lifestyle decisions; for example, whether to take a mentally-challenging college course in the summer or winter. The results also suggest that clinical trials involving people with MS should take temperature into consideration when designing the study and interpreting the results, especially when cognitive testing is used as a treatment outcome measure. Eye Movement Training Focuses on Improved Balance A controlled study suggests that a six-week balance and eye movement-focused exercise program improved balance, reduced fatigue, and reduced disability because of dizziness or disequilibrium in a group of people with MS. The effects lasted for at least four weeks following supervised training. Larger and longer studies are needed to determine how long the benefits last, and which people with MS would be most likely to respond to the program. The study by Jeffrey Hebert and colleagues at the University of Colorado, Aurora was partially funded by a pilot research grant from the National MS Society. This study is the first to examine the effects of an exercise program involving balance and eye movement training â&#x20AC;&#x201C; or â&#x20AC;&#x153;vestibular rehabilitationâ&#x20AC;? -- in people with MS to see if it improves both fatigue and balance. cells in people with active MS. The study provides an intriguing lead to a factor that may either cause or result from immune attacks in MS or other disorders. Further research will be needed to better define the unknown role of this factor and its possible implications for people with multiple sclerosis. Dallas and Houston Researchers Examine MS Triggers in Kids Investigators nationwide are recruiting children with early relapsing-remitting MS or CIS (clinically isolated syndrome, a single episode of MS-like symptoms), and children without MS or CIS for a four-year study to determine environmental and genetic risk factors that make children susceptible to developing MS. The study, funded by the National Institutes of Health, leverages the National MS Society’s support of the Promise: 2010 Pediatric Network of Centers of Excellence. Findings from the study should help researchers understand more about how MS begins in children; this better understanding can eventually be applied to adult forms of MS. Those under age 18 who had disease onset (MS or CIS) in the last two years may enroll in this study with the consent of their parents. Children without MS or CIS can enroll if they are 19 or younger and don’t have a demyelinating disease or an autoimmune disorder (except asthma). Texas sites that are enrolling participants include the MS Clinic for Pediatric Neurology at Texas Children’s Hospital in Houston and The University of Texas Southwestern Pediatric Demyelinating Disease at Children’s Hospital in Dallas. For further information on this study, contact Janace Hart with the University of California – San Francisco at 415-514-2476. For more information on these and other MS research advances, visit the Society online at nationalMSsociety. org and click the Research tab.